This week's Sweet Melissa Sundays (SMS) recipe was chosen by Julie of A Little Bit of Everything: Irish Soda Bread. It's called that because it uses baking soda instead of yeast as the rising agent. As such, this recipe is quick and easy and does not require any "rising time." I found this recipe to be easy and straightforward. The recipe calls for golden raisins and currants, but I had neither on hand so I added dark raisins and dried cherries to mine. The only problem I ran into was the dough being extremely sticky. Melissa says to use "a little flour" if needed, to form the dough into a large round. I had to add a lot of flour to mine before it was even manageable. I was worried that in doing so, I over worked my dough and the bread would not turn out very good, but in the end I still had a nice bread to show for it. Traditional Irish soda bread doesn't contain any dried fruit in it, it was only in later years that the dried fruit was mixed in, but I found the fruit to be a nice addition. 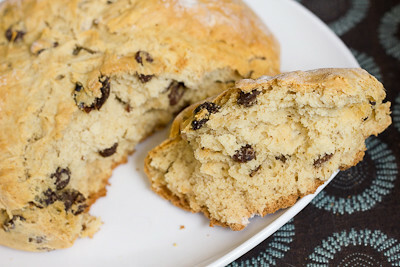 I've never had Irish soda bread before, but I really don't think that I would like the version without the dried fruit. Thanks, Julie, for hosting this week. Overall, I thought this bread was good but I think I much prefer yeast breads over this one (even if they do take longer). If you'd like the recipe, you can find it here. 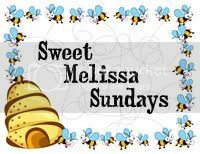 Make sure you check out the Sweet Melissa Sundays Blog Roll to see how everyone else enjoyed this traditional Irish treat! And last but not least - I've just posted another big giveaway - you have until April 11th to check out my Stouffer's review and enter to win a $100 Visa gift card. Also, if you haven't already entered my other giveaway, make sure you click here and enter to win before March 31st. - I found that this bread took much longer to bake than indicated. I had to bake mine an additional 10-15 minutes before it was done. Well you could never tell you had any issues with this bread girl. It looks perfect to me. What a nice bread!! !It looks delicious! Hi! Thanks for baking along with me this week. It is a totally different flavor than an yeast bread but we liked it. Great post--I didn't realize that about the baking soda. Have never had irish soda bread before....but, like you--LOVE yeast breads and feel they are worth every minute put into them! 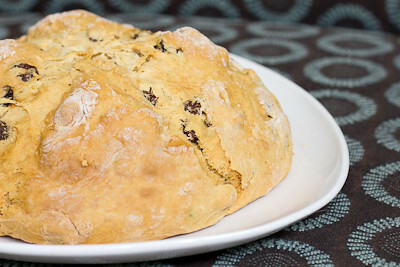 I so wish I made Irish soda bread this year! I mean, I suppose I still can :) I love it! YUM! I didn't get around to making soda bread this year, but your loaf looks delicious :) I don't think I would like it without the dried fruit either!